For many of us, the beginning of a new year means two things: resolving to work out more than once a week (fine print: once a month) and stashing away the booze and butter in favor of kale and coconut oil. Of course, this isn’t always an easy task in NYC, where delivery apps reign and gyros, ramen, and pizza are just footsteps away at any given moment. Luckily for us, the city's best chefs have a few ideas for how to make healthy eating a lot less terrible than it seems. 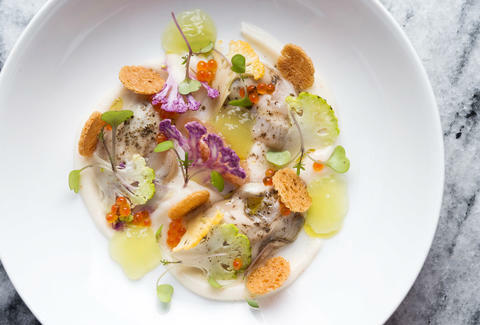 From the veggie-forward to the seafood-centric, here are seven recipes from the city’s top chefs that you’ll actually want to make. Blanch the cauliflower until fork tender and then blend in a blender until smooth. 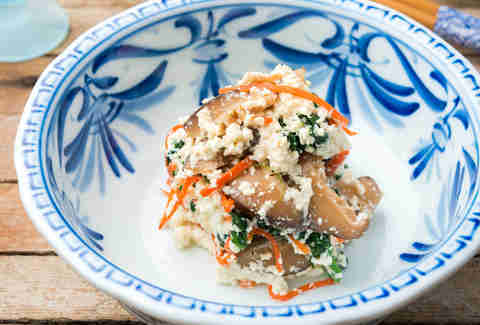 When the cauliflower cools down, incorporate in the heavy cream. Season with grated horseradish and salt. Pass an apple through the juicer and then heat up the juice in a pot. Add the gelatin sheet and stir until it dissolves. Let the mixture cool until it thickens. Place the cauliflower purée over the plates, then place the oysters on top. Add in a couple spoonfuls of apple jelly, shaved cauliflower, and toast rings. Drizzle a bit of olive oil and top with some trout roe (if using) and a few sprigs of microgreens. In a small bowl combine vinegar, salt, and sugar and mix well. Add olive oil and whisk with a fork until combined. Pick about ¼ cup of the green fennel fronds and set aside. Cut off the tops, halve fennel bulbs lengthwise, remove tough outside layer, and discard. 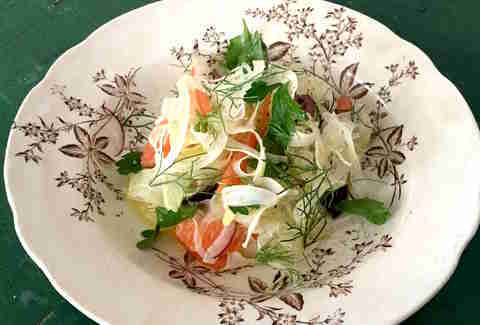 Using a mandoline, slice fennel lengthwise as thinly as possible into a large salad bowl. Using a sharp paring knife, remove the skin and pith from the orange. Cut out segments and add to the bowl. Add the onion, olives, and half of the parsley and fennel fronds. Drizzle with the vinaigrette and toss lightly to combine. Season with salt and pepper and garnish with the remaining herbs. Prepare a bowl of icy water. Add spinach to boiling water, stir well, and cook for 20 seconds. Use a slotted spoon to transfer the spinach to icy water. Stir well, drain, firmly squeeze the spinach to remove as much water as you can, and set aside. Combine shiitake, carrots, dashi, 1 1/2 tablespoons mirin, two teaspoons soy, and the salt in a small pot and bring to a boil over high heat. Reduce heat to maintain a simmer and cook for 10 minutes, so the dashi flavor begins to infuse vegetables. Take the pot off the heat and let cool slightly. Add spinach, stir well to loosen the clumps, and let the mixture sit at room temperature for at least 30 minutes or up to 2 hours. Take 2 whole sweet potatoes. Wash thoroughly and cut lengthwise into 1/2 inch cubes. Lightly toss potatoes in olive oil, salt, and pepper. Spread cubed potatoes as one even layer on a large baking sheet. Roast, tossing occasionally, for about 1 hour. Remove from oven and allow to cool. Place walnuts onto separate baking sheet and roast for 5 minutes at 350°F (175°C) . When ready, walnuts will smell toasty and be a shade darker. Remove from oven and set aside to cool. On a stovetop, bring 2 cups of water to boil, then add golden quinoa, turn off heat, cover for 15 minutes. Allow to cool. Slice each avocado into 2 halves. Remove the pit and slice the halves once more, creating 4 quarters of avocado. Gently pull the peel of each quarter and continue to slice avocado into half-moon shapes. Repeat same method using the green apple, slicing apple into half-moon shapes. Take both bunches of kale. Use your fingers to remove kale leaves from the stem. Once all kale leaves have been removed from the stem, rinse kale with water to ensure leaves are thoroughly washed. Chop kale into bite-size pieces then place kale into a mixing bowl. 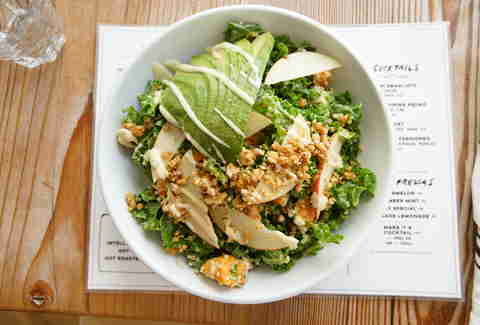 In a large mixing bowl combine, kale, quinoa, sweet potato, and dressing to taste and garnish with slices of avocado, toasted walnuts, and sliced apple. Combine vinegar, honey, and Dijon mustard into a blender. Blend ingredients on medium speed, slowly adding in olive oil to emulsify the dressing. In a medium pot over medium heat render the fat from the bacon then add jalapeños and garlic. Cook about three minutes, until softened and very fragrant. Add tomato paste and cook another few minutes before adding the beans and molasses. Cook stirring about 5 minutes, then deglaze with chicken stock. Add cider vinegar and salt, then turn the heat to low and simmer until the liquid is reduced by three quarters. Either remove the bacon and discard, or remove the bacon, cut into thick lardons and reserve for garnish. Stir in the kale and allow it to wilt until you are ready to serve. Top with poached eggs and bacon, if desired. Toss the carrots with the olive oil in a large bowl, and coat thoroughly. Add the salt and toss to coat. Combine the honey and 1/2 cup warm water in a small bowl and stir until thoroughly mixed. Lay the carrots out on a large rimmed baking sheet or roasting pan so that they are evenly spaced and do not touch one another. Drizzle with the honey mixture and put the carrots in the oven to roast. Roast until all of the water has evaporated and the carrots are soft and beginning to brown, 35 to 40 minutes. While blending, add oil slowly to emulsify. Zest the orange, then halve and juice. Combine all ingredients in a mixing bowl, sprinkling in the salt and mix well to combine. 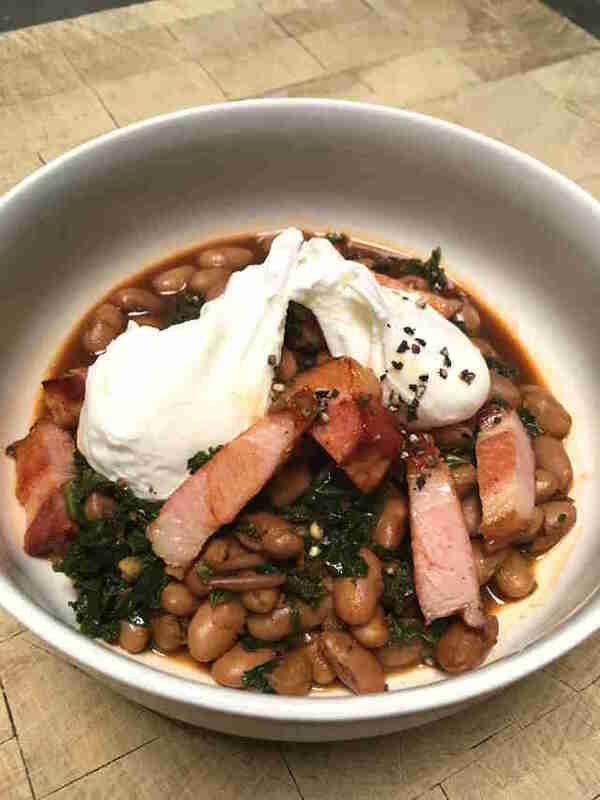 Let sit minimum 4 hours before serving to let beans absorb flavors. Add oil, minced vegetables, salt, chili flakes, and oregano to pan and cook over high heat stirring often. Turn down heat to medium once the veggies give off their liquid and boil, cook for about 30-45 minutes. Once oil and liquid have separated and veggies are starting to stick, add the tomato paste. Cook another 10-15 minutes until brick red, scraping bottom to prevent mixture from burning. Add vinegar and chopped olives, and cook for 2 minutes. Then remove from heat and cool. Stir well before using. In a large sauté pan over medium heat, roast vegetables until soft throughout and slightly caramelized. Season with salt and lime juice to taste. Toss with two tablespoons of chermoula, or more if desired. 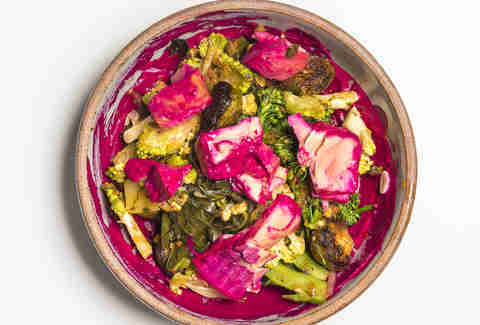 Plate with a generous dollop of beet tahini and drape the roasted vegetables over the plate as they fall. Nicole Schnitzler is a freelance writer who resolutes to keeping the Champagne, oysters, and caviar flowing until NYE 2017. Follow her on Twitter at @write_to_eat and Instagram at WriteToEat.